SPECIAL OFFER: - Limited Time Only! A large fabric selection and ever-changing displays at O’Susannah’s Quilts & Gifts in Watkins Glen, New York, draws local quilters and tourists alike. The first floor of the downtown brick building serves as the quilt shop, O’Susannah’s Quilts & Gifts, and the second floor houses The Upstairs Inn, a tranquil space for quilters to unwind and sew. Shop owner Sue Knapp takes great pride in rotating the many quilts on display. Front row, from left: Jean Lathrop, Karen Rhodes, Wilma Coots, Sue Knapp (owner), Deborah Sanford, Vicki Olmstead, and Sharon Bristol; back row: Cathy Mathews and Eleanor Lattin. An always-changing seasonal display aims to inspire. Antique furniture pieces add to the richness of reproduction-inspired vignettes. Plenty of handwork projects are available for customers looking for something portable. The Upstairs Inn offers a comfortable and well-lit retreat space for quilters. Subtle scrappiness and hints of machine appliqué set the scene in a holiday-theme quilt. Susannah Knapp and Jeanne Knapp designed Happy Holly Days for Quilt Sampler® Fall/Winter 2013 magazine. Deborah Stanford machine-quilted holly leaves in each “O” formed by adjacent Oh Susannah blocks, pebble and crosshatch motifs in the tan print block backgrounds, and a meandering swirl and holly leaf motif in the border. 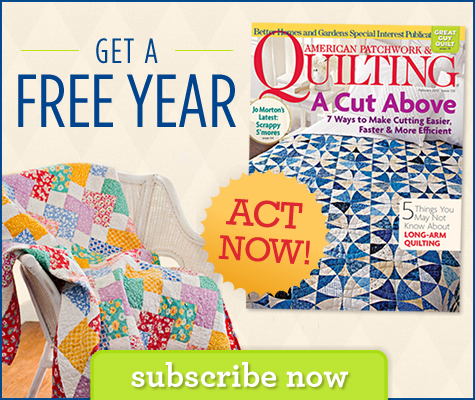 Contact O’Susannah’s Quilts & Gifts  to purchase a copy of Quilt Sampler® Fall/Winter 2013 magazine, pick up the issue at your local quilt shop or newsstand, or get the digital issue online . Peek inside JEllen’s House of Fabric , another quilt shop featured in the Fall/Winter 2013 issue. Copyright © 2013, Meredith Corporation. All Rights Reserved.